I was in western Belgium in August 2014. What I saw and learnt about the First World War while I was there has stayed with me. I was in Belgium because I was playing at the Dranouter Festival with Wilful Missing. The rolling green landscape that surrounded the festival site was a very pleasant setting indeed. However, I kept thinking back 100 years to the war that was about to begin, and that would turn fields like these into appalling battlefields. 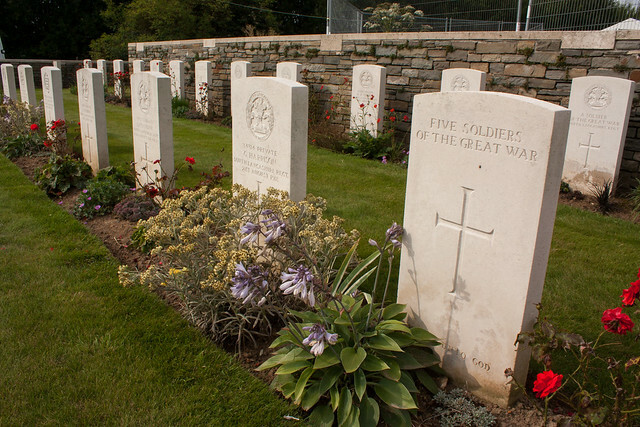 The land on which this cemetery stands is the free gift of the Belgian people for the perpetual resting place of those of the Allied armies who fell in the war of 1914-1918 and are honoured here.